Clemson Girl: Marley Lilly monogrammed hat giveaway winner! 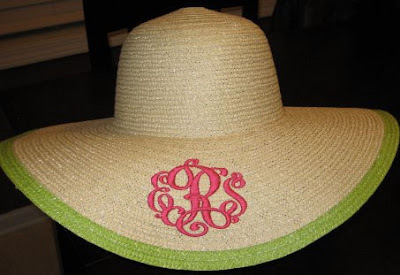 Marley Lilly monogrammed hat giveaway winner! We are super excited to announce the giveaway winner of the monogrammed derby hat from Marley Lilly! As usual with Marley Lilly giveaways, the response was overwhelming! No surprise that our readers are as in love with Marley Lilly's adorable monogrammed items as we are. Congrats Amanda!! Please email us at clemsongirlblog@gmail.com to claim your prize. If we do not hear from the winner in 48 hours, we will draw a new winner. Thanks so much to everyone who entered and helped spread the word about the giveaway. Even if you didn't win, these hats are too cute and too affordable to pass up - so hop on over to Marley Lilly's website and get one of your own. And be sure to 'Like' their Facebook page so you can be the first to know of their new monogrammed items that come in. And of course... big, big thanks to Marley Lilly for sponsoring yet another fabulous giveaway! We're halfway through the week and almost to the weekend! Whoo hoo!